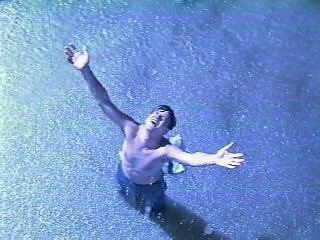 One of my all time favorite movies is The Shawshank Redemption. It is by Stephen King and from the first time I saw it, I loved it. One of my favorite scenes is right after the main character (played by Tim Robbins)decides to play some music over the intercom. 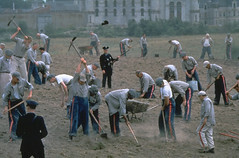 It is some opera music of some sort, and when he plays it, all of the inmates stop what they are doing and listen to this music. The narrator (Morgan Freeman), who also plays one of the inmates, talks about how he had no idea what that woman was singing about, but how beautiful it was. The narrator then states, "Andy got two weeks in the hole for that little stunt." 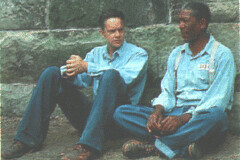 The movie then switches scenes to Andy (Tim Robbins), who is sitting in his Solitary Confinement cell. In the Script of this movie it says, "Andy doesn't seem to mind. His arms sweep to the music still playing in his head. We hear a FAINT ECHO of the soaring duet." HEYWOOD - Couldn't play somethin' good, huh? Hank Williams? ANDY - They broke the door down before I could take requests. FLOYD - Was it worth two weeks in the hole? ANDY - Easiest time I ever did. HEYWOOD - No such thing as easy time in the hole. A week seems like a year. ANDY - I had Mr. Mozart to keep me company. Hardly felt the time at all. RED - Oh, they let you tote that record player down there, huh? I could'a swore they confiscated that stuff. ANDY - (taps his heart, his head) The music was here...and here. That's the one thing they can't confiscate, not ever. That's the beauty of it. Haven't you ever felt that way about music, Red? RED - Played a mean harmonica as a younger man. Lost my taste for it. Didn't make much sense on the inside. ANDY - Here's where it makes most sense. We need it so we don't forget. ANDY - That there are things in this world not carved out of gray stone. That there's a small place inside of us they can never lock away, and that place is called hope. RED - Hope is a dangerous thing. Drive a man insane. It's got no place here. Better get used to the idea. ANDY - (softly) Like Brooks did? We have a hope that is here and today. Not just the thought that we will one day be liberated, but that we can live liberated now! It is sad how many Christian people respond like Red. They feel like it is pointless to consider hope for today, that all we are to do is sit around and wait for our parole to come up. But our hope is to be today! On this earth is where it makes the most sense to have hope. Hope that this isn't all there is. Hope that there are bigger things. Hope in a savior that knows and understands because he put in his time in this fleshly prison, and paved the way to freedom. Hope is a wonderful thing. Don't let anyone tell you differently. Man, do they know me! !